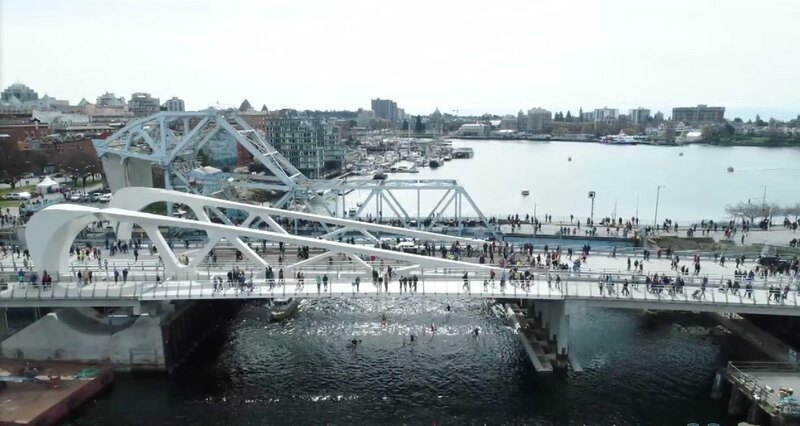 On March 31, 2018 the City of Victoria celebrated the official opening of the Johnson Street Bridge – the culmination of a 10-year process. We are excited to see the work of the City of Victoria and consulting engineers MMM/WSP (original bridge design by Wilkinson Eyre Architects) come to be in this truly state-of-the-art bascule (moveable) bridge. The 46-metre-long bridge has three lanes for vehicles, on-road bike lanes, a multi-use pathway for pedestrians and cyclists, and a separated pedestrian-only pathway. In fact, over 50% of the bridge deck space is for pedestrians and cyclists. Connect Landscape Architecture has been working with the City to revitalize nearly 3 acres of additional public realm improvements connecting public spaces on both sides of the new bridge. The long-term vision is to create a landmark arrival and gateway connecting people through the creation of public waterfront places including: waterfront public park on the repurposed S-Curve Lands, public plaza and promenade on the Northern Junk historic site, and a gateway marker at the intersection of Pandora, Johnson and Wharf Street. The S-Curve Lands feature festival seating built into the hill with views towards the historic Fairmont Empress and Inner Harbour. The Northern Junk has an industrial feel with a feature ‘story walk’ leading pedestrians towards the new bridge and waterfront. The Triangle Island will feature large-scale urban public art designed by artist in residence, Luke Ramsey. The David Foster Way pedestrian path below the new bridge allows views to the dramatic bridge structure and connects the Northern Junk to the Janion Plaza along the harbourfront. In spring of 2017 the City approved temporary works designed to connect pedestrian and cyclist flows across and under the bridge as part of David Foster Way improvements. In summer 2018 the first steps towards creation of these public spaces will take place in phased installations. Largest single-leaf rolling lift bascule bridge in Canada – one of the largest of its kind in the world.